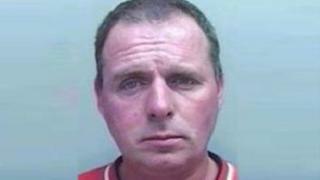 A man has been charged with murdering a vicar in South Gloucestershire and a retired teacher in Worcestershire. Stephen Farrow, 47, is accused of stabbing to death the Reverend John Suddards, 59, at his vicarage in Thornbury on 14 February. Mr Farrow is also charged with murdering Betty Yates, 77, who was found at her cottage near Bewdley. The retired teacher was found stabbed to death at the foot of her stairs on 4 January. Mr Farrow, who was arrested in Folkestone, Kent, on Sunday following a tip-off from the public, is due to appear before magistrates in North Avon on Thursday. He also faces a charge of burglary relating to a property in Thornbury, between 21 December and 3 January. Mr Suddards was found stabbed to death at his home next to St Mary's Church in Castle Street, Thornbury, by builders who had arrived for a planned job. They had been given a key by a caretaker. A post-mortem examination revealed the vicar had died from "multiple stab wounds". Mr Suddards had spent more than 10 years at St Nicolas Church in Witham, Essex, before moving to Thornbury six months ago. Mrs Yates, a retired teacher, was found stabbed to death at the bottom of the stairs at her home on the banks of the River Severn on 4 January. Police said she had been stabbed and beaten with her walking stick.